The laws of minimalist solutions in interior design seem to be impregnated with Eastern wisdom - "Do not clutter up the space around yourself with massive furniture!". But it is far from always possible to get rid of the old house attributes painlessly, especially if it differs in functionality and spaciousness. In American living quarters, it has long been practiced to create special niches and built-in closets for storing things and saving space. «Usefull"The trend not so long ago reached our countries. Shelves from plasterboard - an excellent idea for optimizing the space, which will easily recycle a variety of chests, sideboards, cabinets and chests. In addition, laconic shelves can make a variety in the overall style of the interior, emphasizing its elegance and identity. 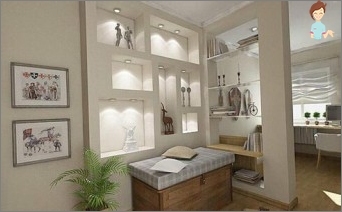 On the built-in shelves from plasterboard you canArrange vases, candlesticks, flowers, books, decorative accessories. They are great for arranging their own collections and souvenirs, purchased in different countries. These racks are able to withstand even multimedia technology, but subject to the presence of strong anchorages and the correct observance of proportions during erection. How about the appearance of a weightless, light, openworkBooks in your apartment? These products can also serve as a partition, for example, between the corridor and the living room. Is not it very functional for the usual enclosing object? How to start creating drywall shelves with your own hands? An old Russian proverb says: "Seven times measure cut once". Use this principle here. You must accurately and in detail imagine how your room, equipped with man-made shelves, will look like in the final version. Transfer your first submission to a sheetPaper, preliminary making measurements and scaling them up to the dimensions of the album sheet. Analyze the desired depth of shelves. Concentrate on what will be put in a new "furniture". If these are bulky items in the form of technology - your offspring will need an additional "reinforcement". The case for small - to decide on the form, size andThe specific location of the shelf. And then - purely technical issues. Calculate how much you will need material, racks, fasteners, jumpers and GCR (drywall sheet). 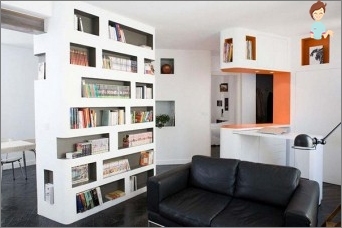 What will bring shelves of plasterboard to your interior? 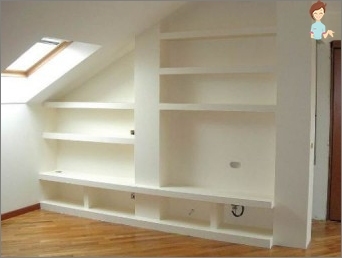 The first pursued goal of erecting shelves fromDrywall in the living room - optimization and expansion of square meters. Why do you need all these old-fashioned cabinets and hanging shelves that occupy a huge amount of space? It's enough to buy materials and create restrained minimalist shelves yourself. This accessory will become an integral part of the interior in the spirit of Loft, Hi-tech, Techno, Modern, Provence and Eclectic. Decorative niches from plasterboard can beFurther highlight from the inside. This will create a charming atmosphere and decorate the living quarters. You can introduce spot lights, or arrange them around the perimeter of the window. You can also use multi-colored lamps to make your living room look like a real museum! The inner wall can be pasted with bright wallpaper orTextured plaster, and in the niche can be introduced collages, stained glass or mosaic. The front wall should be decorated with stucco. The combination of glass and mirrors in the shelves - approaching the real Hollywood luxury in your home. If you decide to decorate the shelf with plasterboardWall in the living room to install a TV or plasma panel inside it, purchase a galvanized profile to ensure the strength of the structure. Shelves in the wall can be supplemented with curtains to hide from prying eyes things inside it. If you decide to get rid of boring furniture andLooking for something new, the plasterboard shelves will be an ideal choice for you. Meanwhile, the use of economical and practical drywall in the interior can play a key role in the layout of the premises. The erection of racks will help you to zonize a large-sized object, bring innovations into it and bring it to perfection. For example, corner shelves from gypsum board are idealWill fit into a miniature office - the workplace area. The partition with built-in gypsum board shelves perfectly suits as a marking of the entrance to the house, dividing the corridor and the hallway with benefit. Shelving from this material can be placed inBathroom. They are suitable as a stand for decorative flowers and a place for storing towels and detergents. But in this case it is important to choose a durable moisture resistant material, which can be used in rooms with a humidity of 70% or more. It turns out that the shelves of gypsum board not onlyComfortable and practical, but also aesthetic. If desired, entire volume cabinets can be created from the product, complementing them with lightweight doors. But we will talk about the creation of miniature shelves as the first stage of modernization of the interior. How to make a shelf of plasterboard? To successfully implement your creative idea, it is important to choose high-quality materials, the general parameters of which meet your requirements and the dimensions of the room to be trimmed. Profile for gypsum board, that is itThe structural skeleton can be wooden or metal. The choice of the product depends on the purpose and purpose of the shelves. The more the load is planned, the more powerful the frame should be taken. Decorative or textured plaster, wallpaper, glass, mosaic, arched profiles - depending on the individual artistic idea. In addition to the basic set, you will needAdditional tools - markers and pencils, tape measure, screwdriver, spatula, brush, office scissors, hammer, pliers and other improvised items that can be found in any house with a working repair. Next - the case for the finishing works, which you must implement for your personal taste. The erection of racks and shelves from plasterboard - the occupation is relatively simple, not requiring special professional skills and abilities. And you can quite deal with it yourself. It is enough to have an artistic instinct, logical thinking and "Direct"Hands. And we recommend that you do not save on tools and materials. Even a trivial roulette, being cheap, can show you false proportions. Approach to repair with the mind, and you will definitely achieve the realization of all the planned projects in the best possible way!